This weekend saw Jane and I go away for the first time without the kids, celebrating Jane’s 50th birthday with a surprise weekend to Paris. Amy, Emilia and I had been planning this for ages, they were both happy to be left alone, probably happier than I was feeling about it if I’m honest. At almost 18 and almost 15 Emilia and Amy were more than capable of looking after themselves, Type 1 issues aside. As we sped into France on the Eurostar on Thursday night, I waited for the Fajita-induced glucose spikes to hit my Pebble watch with the data sent by Nightscout. I would have preferred that the kids didn’t start with the most evil of glucose-spiking meals on our first night away, but this was their choice and Amy knew it would need managing. Nightscout for a trip like this was a Godsend, although typically our house WiFi had started going wrong minutes before we left the house and Amy’s phone had run out of 3G data allowance. Somehow a low 3.2 notification got to my phone and nervously I thought I’d check-in with Amy and request she check her level. At 10:30pm, as Jane and I went out to a cabaret I bid Amy bonne nuit. ‘Bees?’ is my way of instantly making Amy laugh, it’s a Cards Against Humanity reference. So I didn’t get to see the nice 22mmol she hit between 2am and 3am as the WiFi had stopped but Amy had managed herself really, really well. Jane and I had a fabulous time on Friday, walking from our beautiful peniche for three nights on the Seine to Invalides and then to the surreal catacombs Jane wanted to visit – ugh! Then up Montparnasse at 5pm to watch the sun go down and the City of Light start to glow. On floor 59 we pulled up two seats and watched the Parisien lights appear before heading off to Bouillion Chartier for dinner. At various times throughout the day I’d glanced at Amy’s glucose levels on my Pebble, she was doing a grand job. I checked in with Carolyn and got some twitter replies from other Twitter friends. We’d heard sirens, a lot of sirens, but had thought nothing of it. Within seconds my thoughts turned to the kids and knowing Emilia was at work I messaged Amy. Amy’s glucose levels overnight had been good, Emilia’s (non-T1) on the other hand were probably another story: she’d been awake half the night worrying reading the newsfeeds. As I fell asleep the night before we thought it was a single shooting or explosion, nothing like the devastation which actually took place. Only in the morning did we realise the extend of the night of terror Paris endured. Logging in to Facebook it suggested that I might be in an area affected by the terrorism and asked two questions: was I there – yes; was I ok – yes. What a great idea this was, especially when I learned that Facebook friends had this information right at the top of their newsfeeds when they logged in. Message upon message rolled in, phone call upon phone call. I put out numerous messages and set up a network of people all set to check in on the kids at various points throughout the day. I guessed Amy and Emilia were still sleeping though; should I wake them, should I leave them sleeping? I waited a bit, I couldn’t wait long though to hear their voices. With most of Paris shut down, hundreds of sirens going off and armed police roaming the streets I peered out of the houseboat’s windows and gazed upon an eerie silent Paris still moving. The absence of tourist boats made the river a quiet place but people were still jogging, cycling and living life on the Rive Gauche. We spent the day walking around the silent Parisien streets using ghosttown Metros to get around. You couldn’t help but feel the sadness of the city. Even with everything going on, Amy and Emilia had dealt with everything brilliantly. 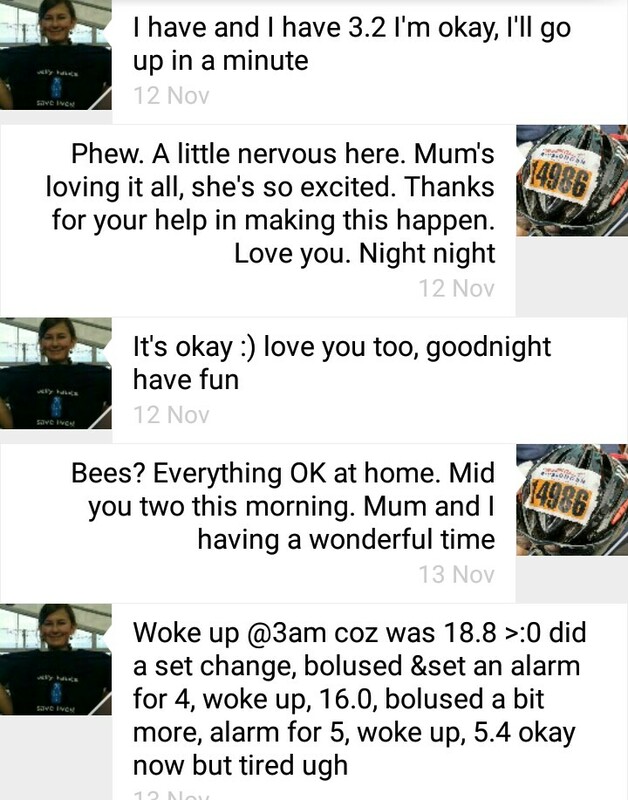 We were of course remotely checking on Amy several times a day but with the odd nudge managed her glucose levels superbly over this trying period. Nightscout estimates over these 4 days she’d have an HbA1c of 6.0%. Tagged cgm-in-the-cloud, dexdrip, nightscout, travel, WeAreNotWaiting, xdrip. Bookmark the permalink. Thanks. It’s taken us a while to get to this point, Nightscout gave me the courage to book the trip out of the country. It’s just such a shame about it coinciding with such sad times in Paris.